Day 03: Leave for Amritsar by train. Afternoon city tour & visit to Wagah Border. Day 04: Drive to Dharmshala. possible visit with Dalai Lama. Day 06: Drive to Manali. Day 08: Drive to Keylong visiting Rohtang Enroute. Day 09: Drive to Sarchu via Baralachala. Day 10: Drive to Leh via Lachalang-la & Tanglang La. Day 11: Visit to Hemis Thiksey and Shey monasteries. Day 12: Drive to Uletopko enroute visiting Alchi & Likir Monasteries. Day 13: Drive back to Leh. Day 14: Full day at leisure for independent activities. Day 15: Fly back to Delhi & back home. Our private tailor - made journeys offer complete freedom of choice. The itineraries shown are designed to give you a flavour of what is possible and can be tailored to suit your preferences. Prices vary according to selected accommodation and season. Dharamsala is beautifully located on a ridge of the Dhauladhar range. The town rises in levels up the hill from a height of 1250m to 2000m. The snow line (not far away) and the dramatic Dhauladhar Peaks rise above the town. Far below are the misty plains. 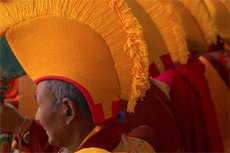 It is the adopted home of the Dalai Lama and it consists of Upper and Lower Dharamsala. The Dalai Lama resides at Macleodgang, Upper Dharamsala. In the colourful Tibetan township are the newly built Gelugpa Monastery and a school of Tibetan culture with an excellent library. Lord Elgin was buried in the gardens adjoining St. John`s Church. The Institute of Buddhist Learning and the Dal Lake are other nearby interesting spots. 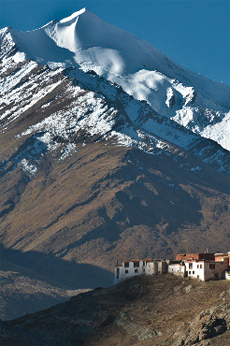 Leh is the capital of Ladakh (altitude 3505 M). Sheltered in the North by the Ladakh range and in the South by the Zanskar mountains, Leh gets very little rainfall. 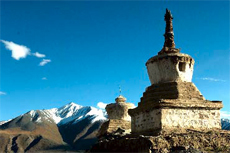 The most attractive feature of the landscape of Ladakh are the Buddhist gompas (monasteries). Situated on the highest point of the mountain spurs or majestically sprawling over cliff-sides, located in the vicinity of villages, these aesthetically leasing, architecturally interesting gompas provide the focus for the faith of the highly religious Buddhist people. 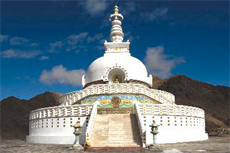 Thikse is one of the largest and architecturally most impressive gompas. There are several temples in this gompa containing images, stupas and wall paintings of Buddha which are exquisite, Hemis - 40 km from Leh, it is the wealthiest, best known and biggest gompa of Ladakh. 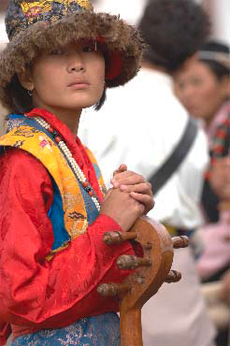 Hundreds of pilgrims gather during the major annual festival held here in summer. It celebrates Guru Padma Sambhav`s birth anniversary. 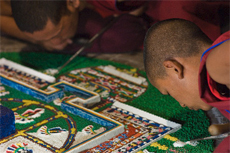 It also has the largest thanka in Ladakh which is unfurled once in 12 years (last was in 1992). Alchi Gompa is the only gompa in the Ladakhi region on the flat ground. 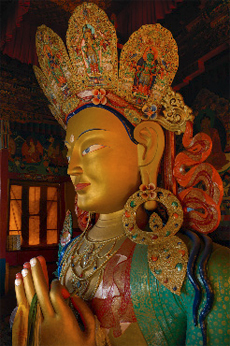 The Gompa was founded in the 11th century by The Great Translator, Ringchen Zangpo. The three storeyed Dharma Wheel Gompa actually run by the gompa in Likir is noted for its massive Buddha statues. Within the complex, there are other status made of clay, lavish woodcarvings, the only examples of Kashmiri style wall paintings in the area and many chortens around the village.